Say Good-bye to dry skin and cracked heels. 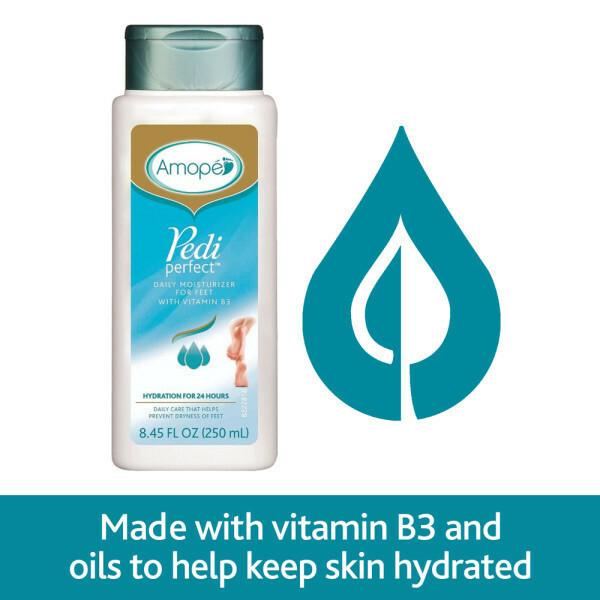 Make your feet soft and beautiful with the Amopé Pedi Perfect Daily Moisturizer for Feet. Say Goodbye to dry skin and cracked heels and, make your feet soft and beautiful with the Amopé Pedi Perfect Daily Moisturizer for Feet. This unique formula is clinically proven to help keep feet hydrated for up to 24 hours. The non greasy foot lotion is enriched with Vitamin A, Vitamin B3, Vitamin E, Omega 6 and natural oils that all work together to rejuvenate your tired, dry feet without leaving a greasy residue. Our cream is so effective, it will help prevent skin dryness when used daily on the legs, heels and feet for at least 4 days. For best results, apply the foot cream liberally to dry feet after using the Amope Electronic Foot File or our other amazing products in the Amope Foot Care Line. Water (Eau), Glycerin, Mineral Oil (Huile Minerale), Sodium Gluconate, Dimethicone, Niacinamide, Cetearyl Alcohol, Dimethylimidazolidinone Rice Starch, Glyceryl Stearate, PEG-40 Stearate, Phenoxyethanol, Ceteareth-20, Methylparaben, Fragrance (Parfum), Tocopheryl Acetate, Xanthan Gum, Magnesium Aluminum Silicate, Citric Acid, Helianthus Annus (Sunflower) Seed Oil, Prunus Amygdalus Dulcis (Sweet Almond) Oil, Propylparaben, Titanium Dioxide, Polyquternium-51. For best results, apply the foot cream liberally to dry feet after using the Amope Electronic Foot File or our other amazing products in the Amope Foot Care Line. I Really Like The Formula And The Way It Keeps My Feet Soft. Would like to no where I can find replacement parts and creams beats paying 35 dollars for a pedicure every 2 weeks.! !